Johann Michael Haydn (September 14, 1737 – August 10, 1806) was an Austrian composer and organist, the younger brother of (Franz) Joseph Haydn who lived between the Baroque and Classical periods. As a renowned creator of sacred music, Michael Haydn concentrated on clarity and simplicity, and favored a simple harmony and singable melody. Even though he was historically overshadowed by his more famous brother, Franz Joseph Haydn, Michael Haydn retained an attitude of God-centeredness within his compositions and his life-style, and understood the power of music in religion as a guidance towards the ultimate reality of God and the eternal spirit. Reutter was so captivated by [Joseph]'s talents that he declared to the father that even if he had twelve sons, he would take care of them all. The father saw himself freed of a great burden by this offer, consented to it, and some five years after dedicated Joseph's brother Michael and still later Johann to the musical muse. Both were taken on as choirboys, and, to Joseph's unending joy, both brothers were turned over to him to be trained." The same source indicates that Michael was a brighter student than Joseph, and that (particularly when Joseph had grown enough to have trouble keeping his soprano voice), it was Michael's singing that was the more admired. Michael Haydn, like his brother Joseph, was a chorister at St. Stephen's in Vienna. Shortly after he left the choir-school, Michael was appointed Kapellmeister at Großwardein and later, in 1762, at Salzburg. The latter office he held for forty-three years, during which time he wrote over 360 compositions for the church and much instrumental music. He was acquainted with Mozart, who had a high opinion of his work, and the teacher of both Carl Maria von Weber and Anton Diabelli. He remained close to Joseph all of his life, and was highly regarded by his brother, who felt that Michael's religious works were superior to his own. 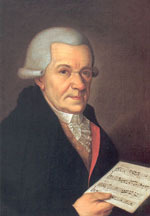 Michael Haydn died in Salzburg at the age of 68. Michael Haydn was the victim of a case of posthumous mistaken identity. For many years, the piece which is now known as Michael Haydn's Symphony No. 26 was thought to be Mozart's Symphony No. 37 and assigned K. 444. The confusion arose because an autograph was discovered which had the opening movement of the symphony in Mozart's hand, and the rest in somebody else's. It is now thought that Mozart had composed a new slow opening movement for reasons unknown, but the rest of the work is known to be by Michael Haydn. The piece, which had been quite widely performed as a Mozart symphony, has been performed considerably less often since this discovery in 1907. The confusion continues to this day: often the Classical Archives page for Joseph Haydn has some MIDI files of Michael Haydn compositions, which are eventually moved to the general H page. Michael Haydn never compiled a thematic catalog of his works. And he never supervised the making of one. The earliest catalog was compiled in 1808 by Nikolaus Lang for 'Biographische Skizze'. In 1907 Lothar Perger compiled a catalogue of his orchestral works for 'Denkmäler der Tonkunst in Österreich', which is much more reliable. And in 1915 Anton Maria Klafsky undertook a similar work regarding the sacred vocal music. Some of Haydn's works are referred to by Perger numbers, from the thematic catalog of his works compiled by Lothar Perger in 1907. St. Peter's Church in Salzburg and the entrance to the Michael Haydn Library. Michael Haydn was spiritually influenced by his father, Mathias Haydn, due to the elder Haydn's overt religious leanings to the extent that he began each important letter he wrote with Jesus Christ be praised. Due to this exposure, Haydn wrote many choral works, and his sacred choral works are generally regarded as being his most important, including the Requiem pro defuncto Archiepiscopo Sigismundo (Requiem for the death of Archbishop Siegmund) in C minor, which greatly influenced the Requiem by Mozart, Missa Hispanica (which he exchanged for his diploma at Stockholm), a Mass in D minor, a Lauda Sion, and a set of graduals, forty-two of which are reprinted in Anton Diabelli's Ecclesiasticon. Hadyn was a prolific composer of secular music, including forty symphonies, a number of concerti and chamber music including a string quintet in C major which was once thought to have been written by his brother Joseph Haydn. ↑ Georg August Griesinger, and Albert Christoph Dies, Haydn Two Contemporary Portraits (Madison: University of Wisconsin Press, 1968, ISBN 9780299027940). ↑ Charles Rosen, The Classical Style: Haydn, Mozart, Beethoven (New York: Viking Press, 1971, ISBN 9780670225101). Michael Hadyn MIDIs at Classical Archives. This page was last modified on 2 October 2018, at 22:36.